In 1948, after World War Two, my father opened his shop in Main Street in our home town back in Ireland. He was a Shoemaker and Repairer and quite good at his trade. It is hard to imagine in this day and age how proud we all were. He had all new machinery and equipment and it seemed as if things were really looking up after the miseries of the previous ten years or so. The war was now over three years, which made me eight years old. Holidaymakers would come in droves from the UK with most of the British cities having their own special week. Our town was a famous seaside resort twelve miles south of Dublin. It was known as Ireland’s Blackpool and also known as The Gateway to the Garden of Ireland. County Wicklow was supposedly the actual Garden. For instance, you would have the Glasgow week, or the Leeds week, or the Cardiff week and so on. The town’s population would swell by about double from eight thousand. Every available room and bed was brought into service and a week’s full board could be had for about £4. It was not unusual for especially the boys of the house, to sleep in sheds or in fact anywhere during these holiday periods. You have got to understand that this was the time before a lot of British working class people had even heard of Spain, let alone thought of having a holiday there. 99 point 999 percent of similar people would never have dreamt of flying in an aircraft, excepting those who had been in the Royal Air Force during the war. Anyway, visitors suddenly realised that Dad’s handmade shoes were, in Ireland, almost as cheap as ready-mades in the UK. 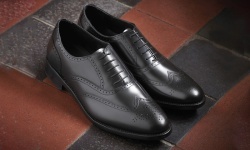 Consequently, from about May onward, he would begin to receive written orders for new shoes to be ready in June, July or August when the customer arrived on holiday. Come to think of it, he charged locals £5 a pair and visitors £6. The visitors were quite happy to pay. In order to fill the orders, at certain times, Dad would be working from the crack of dawn, about 5am. until way past dark into the night. He would make, I suppose, two pairs a day besides keeping up with his normal repair trade. These were good times as it kept him out of the pub and away from the toss-school on Sundays. It did, however, mean that all his meals had to be taken to the shop. The children who were old enough, in strict rotation, took his meals there. This was the major version of the Sunday morning ritual, when again in strict rotation, one of us would take Dad’s breakfast up to him in bed. It was the only time that he did stay in bed a bit late. His breakfast comprised of a very large fry-up, which would be known to-day as a major cholesterol boost. Once again, anything he left belonged to the one taking up the breakfast. I know I did, and I strongly suspect that the others did as well, pray with the most devout fervour, that he had been drinking the night before and could not eat anything. On a really bad morning, you would get nothing more than a couple of rasher rinds. 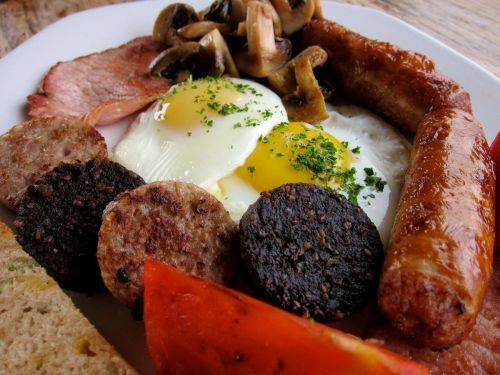 However, on a truly magnificent morning, you might be lucky enough to get a couple of eggs on fried bread, sausages and all the black and white pudding. That was like winning the lottery…………. I decided that I had to do something quickly. If I went home, my mother would kill me and if I told him, he would even do worse, if that was possible. I suppose it is really, come to think of it, especially if he kept beating you silly before he actually killed you. At least Mum would have been quick. Anyway, I sat on the kerbstone, picked up all the bits and pieces, wiped the enamel plates with my sleeve and began a reconstruction. The sausages I cleaned by licking them clean in my mouth quickly followed by a large spit out of the rubbish stuck to it. Next came the black and white pudding, which I similarly cleansed. There was a problem with the fried bread as some grit was stuck to it. However, with the aid of a matchstick from the gutter, that too was removed. The two eggs were licked clean and replaced onto the fried bread. Oddly enough the rashers of bacon looked pristine. “There, he would never notice”, I said to myself “but I must remember that whatever he leaves, I must not eat as I might get poisoned”. It never occurred to me that he might be so affected. Right, so onward I went. To the shop and I gave him his meal. I was obliged to wait at the counter until he was finished. He soon got stuck in and was really enjoying himself. I thought to myself that I had made a remarkable recovery from my misfortune. After a couple of minutes, I noticed that a bunch of my father’s drinking cronies began to arrive and lean on the counter. “Are you enjoying your grub Paddy?” one asked. “Too true” said my Dad “the best of Lockner’s (a local pork butcher) - are you jealous?” “No” they chorused, “I bet it has a great flavour?” added one. “Too true” said Dad. “It should do” the other said to Dad, “Mick just hopped it all over Main Street. It must be covered with BillyCastle’shorseshit”. Oh my goodness. I did get a smile from this one. You used your imagination and improvised. You took a bad situation and fixed it. Great story and I enjoyed this so much. You have a way with poetry and also, telling a good story. Thank you Wendidawn: I was very lucky that my Dad never caught me .....Mike. Ahahahaha! You're lucky he never caught up with you that day! I'm glad he didn't do anything to you after all. And I'll bet you never dropped any food ever again, after that! Thank you SouthernCharm: It is strange but at a family Wake, my youngest brother on hearing me tell this story, claimed that it was he who did it. After I spoke with him it appeared that it also happened to him on his bike when he was taking the meal to my father. He ran into a car and dropped the meal all over the road. Unlike me, he returned home where Mum gave him what for......Mike.